BEIJING, China, January 17, 2018 (ENS) – An Iranian tanker carrying a full load of natural gas condensate that sank Sunday has been found on the bottom of the East China Sea, China’s Ministry of Transportation reported Wednesday. Leaks from the wreck now cover a total of 101 square kilometers, Chinese marine officials say. China is sending a robot submarine, and possibly human divers as well, to further investigate the shipwreck, officials said. The Panamanian-flagged ship Sanchi, with 136,000 tonnes, about a million barrels, of condensate aboard, caught fire after colliding with the CF Crystal, a Hong Kong-registered bulk freighter on January 6. After burning for a week, sending thick black smoke hundreds of meters into the air, the Sanchi exploded and sank Sunday about 530 kilometers (330 miles) southeast of the city of Shanghai on the Yangtze River estuary. 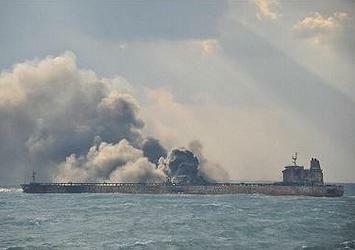 All 32 crew members on the tanker, 30 Iranians and two Bangladeshis, perished. Two bodies and the tanker’s black box were recovered from the Sanchi before it sank. All 21 crew members of the freighter were reported safe. Officials are calling it “the worst oil spill disaster in decades” and comparing it to a tanker spill in 1991, when 260,000 tonnes of oil leaked off the East African coast of Angola. After the collision occurred, strong winds pushed the Sanchi away from the Chinese coast into Japan’s exclusive economic zone. Chinese officials say an oil slick extending 58 square kilometers (22 square miles) from the sunken vessel is being monitored for environmental damage, and several ships are now working on cleanup. The Shanghai Marine Search and Rescue Center sent 13 vessels on Tuesday to tackle follow-up issues, maintain order at the site, evacuate nearby merchant and fishing ships, and issue navigational warnings in Chinese and English. The sunken tanker is leaking condensate in the middle of some of China’s richest fishing grounds, which concerns environmentalists. Chinese environmentalist Ma Jun was quoted by CNN as saying the spill took place in the country’s largest fishery, the Zhoushan fishing ground. The Zhoushan fishing area contains the Zhoushan archipelagos, with a population of nearly one million, including over 300,000 fishermen. Scientists have identified more than 300 species of fish, over 60 species of shrimp and more than 10 species of crab in the area.